Internet Download Manager (IDM) is one of the most famous download manager used throught the world. Well, most use it as a trail version. Todays post will help you all to crack IDM and use it forever. we have a tool that makes the updating & cracking of IDM very easy. The only thing you need to do is to click the right options. Download and install the latest version of IDM. Ignore if you have already installed. Press the Start button. 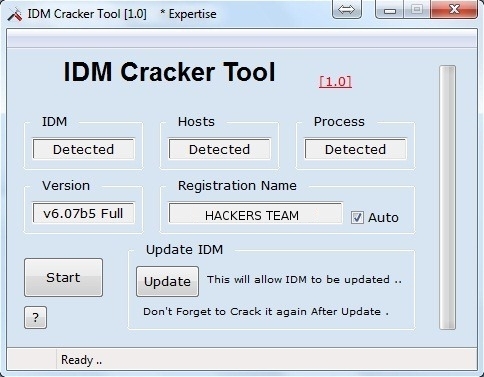 The IDM Cracker will do all the work. 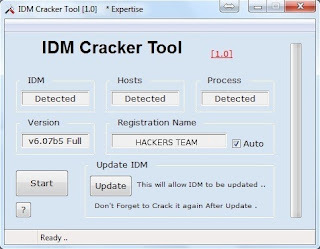 Run the IDM Cracker Tool. Press the Update button , this will allow you to update IDM. Click on check for updates in IDM so that it can update itself. After the update is complete and new version of IDM is installed, now once again open IDM Cracker Tool and click on Start. That’s it. Your IDM is again fully cracked. Repeat these steps whenever new version of IDM is launched. As per your information. It seems that while cracking IDM through this tool, you are connected to internet. I suggest you to crack IDM once you are disconnected from internet. and then check its working or not. If you still face the same problem. report it to me. i will provide you a new tool to do the same..
Best Viewed in Google Chrome. © Hacker's Team 2012. Powered by Blogger.